During the June holiday, we decided to take a road trip to the East Coast of Malaysia. It’s a long long drive, covering coastal area of Terengganu and then all the way to the Thai Border in Kelantan, but this part of Malaysia is beautiful, especially the beaches. We started the journey noon time, lunching on sandwiches in the car. Back in 2009 when we visited Cherating, we had tea at the famous Hai Peng Kopitiam in Chukai, we recalled it was really good, so we drove into Chukai town thinking of taking a tea break there on our way to Terengganu. Arriving at Hai Peng Kopitiam, we found that the shop has closed and relocated, and it has also been renamed, due to some ‘family ownership’ dispute. 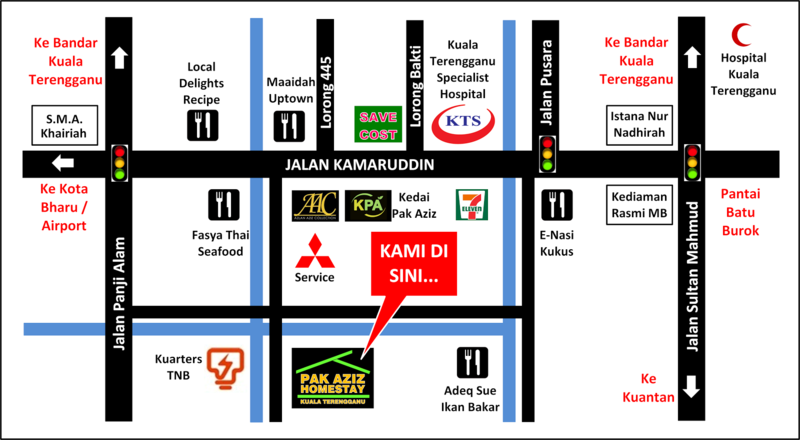 It’s now called Sukiyang Kopitiam (located at : PT11283 Jalan Belatuk, Taman Chukai Utama, Fasa 3, Terengganu). We went searching for it, and arrived to find the Kopitiam almost full house. What is the verdict? Service was lousy, had to wait so long for our toasts and drinks (coffee, tea and milo), and everything was just so-so. I bought a pack of ground coffee back, and it’s RM17.90 for a 200g pack, very expensive for local coffee. The worst is, this is not the same ‘kopi’ as what they served in the kopitiam, it was darker and not so aromatic. I . felt . being . conned. Pressing on, we arrived at Kuala Terengganu at dusk. Not knowing where to eat, we used Tripadvisor to look for a restaurant and decided to try Adeq Sue Ikan Bakar (located at : Batu Buruk, 20400 Kuala Terengganu). We followed the Tripadvisor map, but it was WRONG! Googled more, and finally found the place using this map. Worth it? YES YES YES!! The 2 grilled fish with sambal petai was so spicy and so yummy; the girls loved their ayam goreng kunyit (fried chicken with turmeric) and fried kangkung; and the best dish was the Tomyam Poktek. A creamy tomyam filled to the brim with a variety of seafood (clams, crabs, fish, prawns), it was so full of flavour. The place wasn’t easy to find, but it was worth the effort. Another hour drive after dinner, and we arrived at our accommodation, Summerland Retreat which is located at Pantai Telaga Papan. So tired after all the driving, we went to bed after a shower. Summerland Retreat is just a 2 rooms vacation home set in a big piece of land. The friendly owners of the place, Oya and Ena, live about 50 meters away in another building. We only took one room at the vacation home, the other one occupied by an Australian and Irish couple. Room is clean and modern. The charm of the place actually lies in the surrounding. The garden is beautiful, and there were the occasional Iguanas and birds that can be spotted. A quiet beach, Pantai Telaga Papan, accessed/used mainly by the occasional locals, is only 100m away. Sand is clean, soft and fine. And the sea, clean, clear and calm. We spent the morning there strolling at the quiet beach. We then took a drive up a little North along the coastal road. Stopping at Pantai Rhu Sepuloh, a small fishing village with a beautiful beach. Fishing boats used were pretty traditional, some were beautifully decorated. We came across a Budu maker at Pantai Rhu Sepuloh. Lots of anchovy like fish were being dried. Budu is a kind of fermented fish sauce used as seasoning and eaten with rice or fish. The fermentation takes place in cement urns like these. As it was not season to make Budu, according to the worker there, the urns were empty, but still leaving a strong fishy smell. Driving further North, we wanted to have lunch at the famous Terrapuri at Kampung Mangkuk. Terrapuri is a resort with old Terengganu Malay Classic houses turned into villas. Alas, they didn’t even allow us to enter the resort compound, claiming there were busy preparing for a big group of visitors arriving, and did not have enough staff to serve us. We just explored the surrounding beach filled with tall coconut trees, with cows grazing peacefully among them. As the hubs wanted to go back to Kuala Terengganu to photograph the Crystal Mosque at sunset, we took the 1hr drive back to the capital city. We wanted to check out China town in Kuala Terengganu, as there were a couple of eateries listed on tripadvisor. Unknowingly we parked near the Turtle Alley (located at : Jalan Kampung China, Kuala Terengganu), and had a chance to check it out. Just a small alleyway sandwiched between 2 prewar shop houses, it’s decorated turtle mosaics art, teaching the public about turtle conservation. And at about 5pm, China town is almost dead. Most of the coffee shops are already closed, no opportunity for us to try out Madam Bee’s Kitchen. We took one last stop near Crystal Mosque, just to view this beautiful mosque from afar, and then headed back to Merang area for dinner. Interesting. You had me at Adeq Sue Ikan Bakar. The food looks so good!